Twitter is 7 today so to celebrate, they’ve given me a little page of my own! A gokette is for life. I need my Aunty Gok. To magic me up a frock! Thanks guys for all your giggle stories from Twitter today they are fantastic! 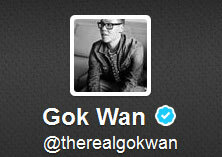 Below are my favourites you tweeted @therealgokwan and @goksworld. You can also use this blog to upload your favourite stories that have made you roll on the floor, pee your pants or cry with laughter! I want to hear them all! @goksworld when I bounce on a trampoline and every time I bounce I let out a bit of pee by accident..
@goksworld when my daughter walked in2 a wall, I burst out laughing. Unfortunately, being 6 mths pg also led 2 me weeing myself! Last laugh? @goksworld my husband having a complete squirmy fit over the skin on milk. He’s a big rufty, tufty squaddie but is terrified of milk skin. @goksworld when my 3 year old tries to make sense of the world. She asked me if cows have bum holes!